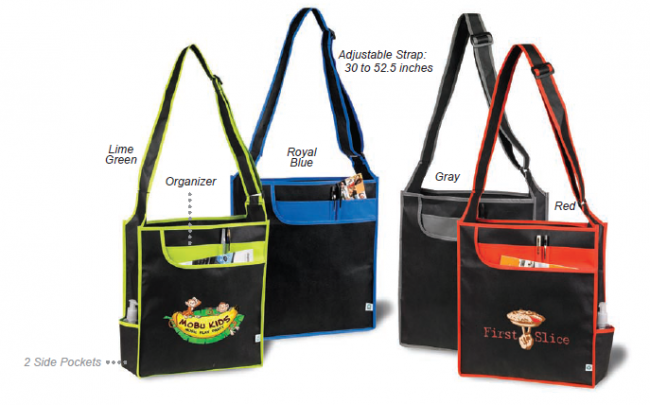 Benson Marketing Group specializes in custom tote bags in a variety of designs and colors. Each bag has an adjustable strap 30 to 52.5 inches long. Each bag has a large front pocket with an organizer inside, pen holders, and 2 open side pockets.There is a one time screen charge of $50 per color in the first order. The imprint area is a 9"W x 7"H silkscreen. Benson Marketing Group specializes in custom tote bags in a variety of designs and colors. Each bag has an adjustable strap 30 to 52.5 inches long. Each bag has a large front pocket with an organizer inside, pen holders, and 2 open side pockets.